Marley Spoon Meal Kit Review – Marley Spoon Discount! So, I thought this day would never come. Seriously. I listen to a.l.o.t. of podcasts when I’m driving around, when I’m on a run, when I’m relaxing in the late evening. And so many of them run ads for other meal box delivery services. And I’d always roll my eyes. And think…no way. That’s just way too expensive. Even with the “first 3 meals free” opportunity. Another eye-roll. I decided to give this one a chance. Because I looked at the meals and thought “my boys would eat that” (I wasn’t sure about some of the other meal options in the other services.) And also thought, with this deal it would be less than a restaurant night out. So this month, I’m trading a restaurant night for a family date night at home. Just to mix things up and be fun. This isn’t for everyone. And this certainly isn’t a $5 dinner. But, it’s an option and there might be good reason to participate in meal box delivery like this. GO HERE to get yours before this offer ends, and meanwhile, check out my thoughts and experience below! 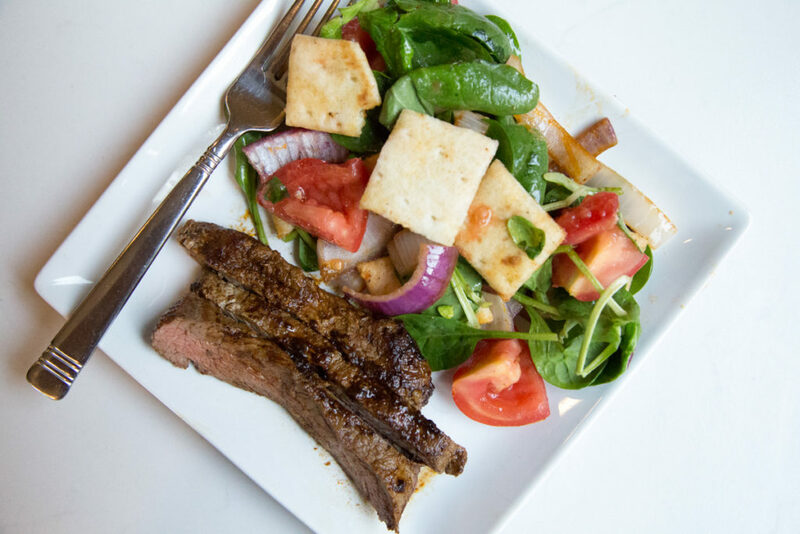 New members will receive $30 off discount from their first order of 2 meals, that is automatically applied at check out. In order to get this savings, you need to use this special link! Everything is shipped to arrive fresher than you might see at the supermarket. We guarantee you’ll be able to use the ingredients for at least 4 days after you receive them, with the exception of fish which should be cooked within 48 hours. Just the right amount of ingredients. 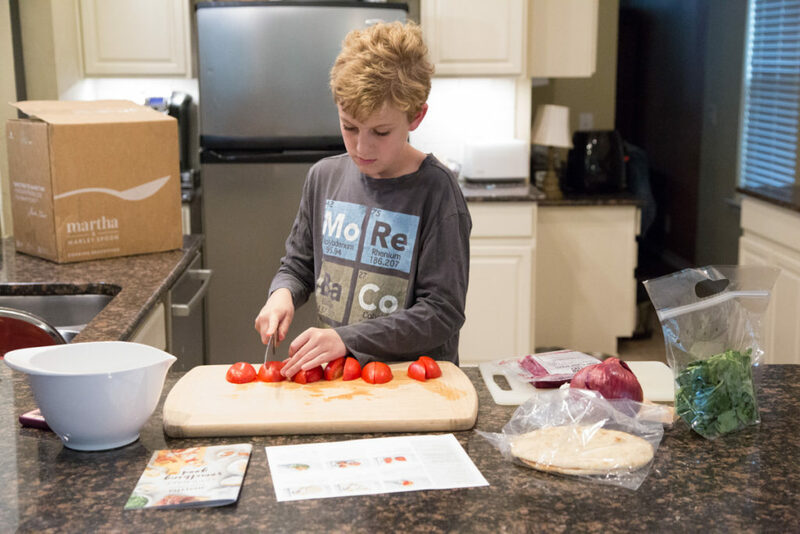 Great step by step instructions – that I ended up using with the boys to walk through. It was really fun to watch them work through one of the meals. Ease and convenience of the app and website to edit meals and adjust account. Simple enough meal prep for the boys to do most of the work. Life transition – when life throws you a bunch of lemons, give yourself grace (so long as you can afford it!!!) and let this cover a few meals each week. Then stop when you can handle dinner on your own again. 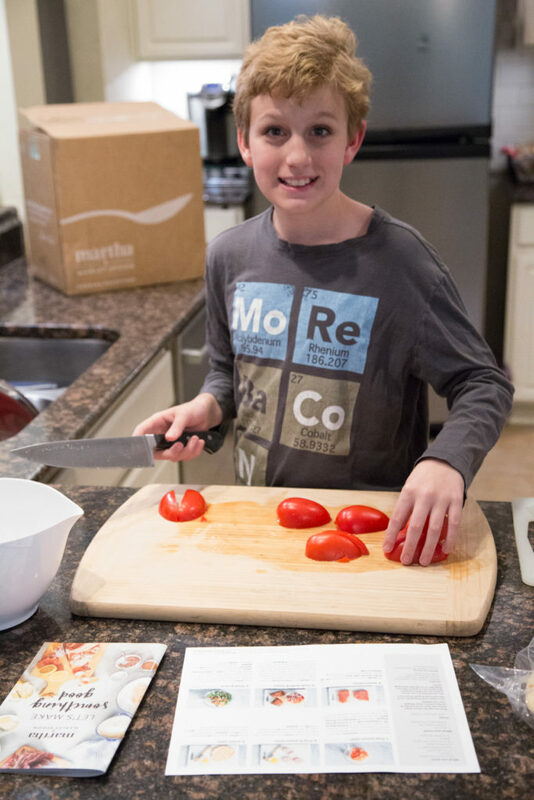 Cooking lessons – give a meal a week a try for a few months to learn some essential cooking skills. For yourself, or your kids. Alternative to dining out – commit to no restaurants for a short time and make these meals at home. I traded out our restaurant night out for this meal at home! I stuck with the recipes that I originally picked. And decided to offer another side dish for both meals – broccoli with the fried chicken and rice with the steak. I did that to fully round out the meals for the boys. If you’re ready to get started…tap below to learn more and get your first box ordered! If you would like to try Marley Spoon – you can go here to get $30 off your first box. And again, it might not be the most cost-effective for regular weeknight meals, it is a nice treat and could be used to learn to cook new things or to try new meals. For us, we used it like a cooking class in a box and it cost less than a dinner out at a sit down restaurant would have. And showing Austin the importance of pushing the pizza wheel AWAY from your body! 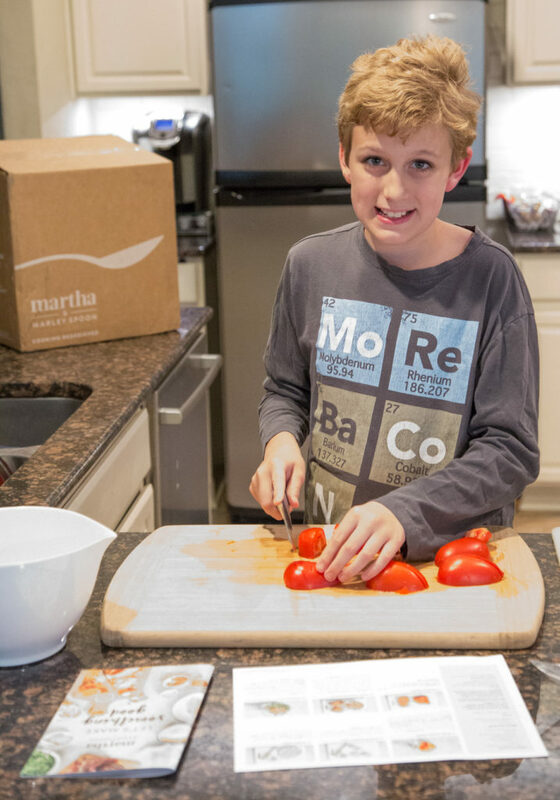 Ryan working on the tomato salad. 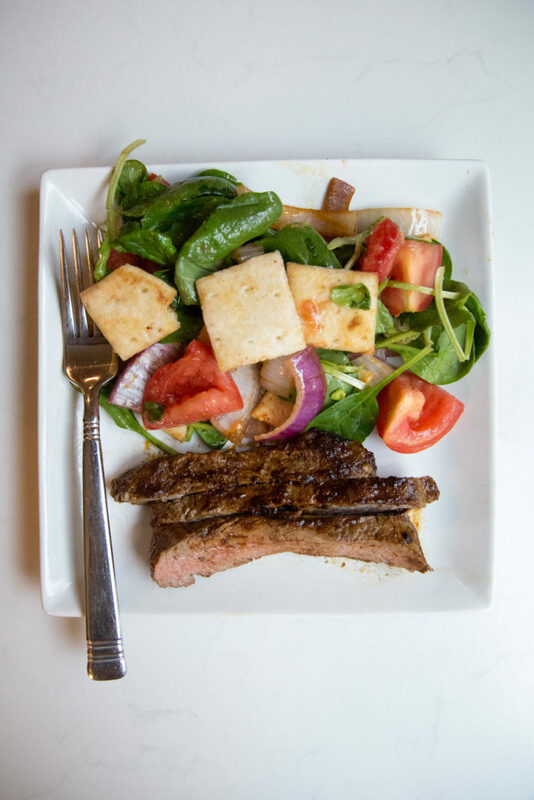 We polished off this Chorizo-Spiced Steak with Salad, it was spectacular and fresh and delightful. And overall, we had a lovely time working together to make this meal! How easy it was from signup to delivery to making the meals. Cost was less than a restaurant outing (even drive through), but same great restaurant style/quality of meal. Watching the boys work through making the meals, learning valuable kitchen and life skills. 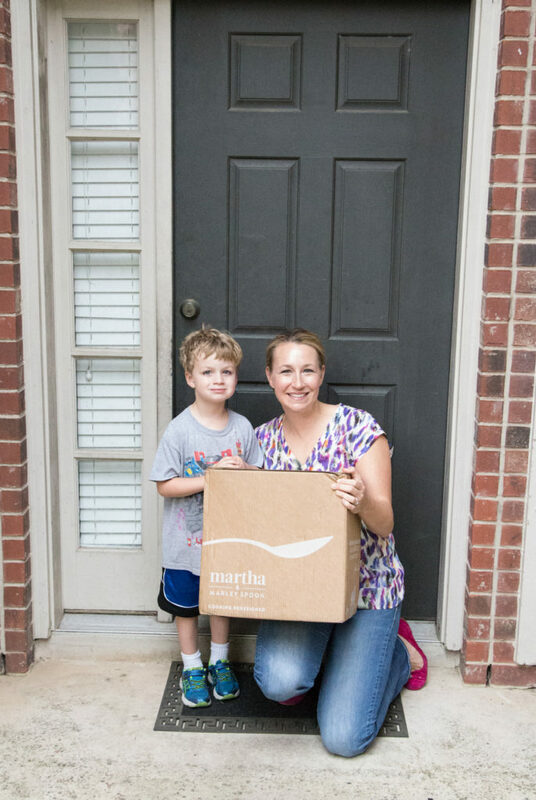 If you’re ready to give it a try, you can get $30 off your first box from Martha & Marley Spoon! And finally, I’d love to hear your thoughts and experience if you do decide to order! Disclaimer: this post and review is my opinion about meal boxes and Marley Spoon, and it contains affiliate links.